One quarter of the rap group Slaughterhouse and VH1's Love and Hip Hop New York reality TV star Joe Budden is set to headline his own show at XOYO in London this March. 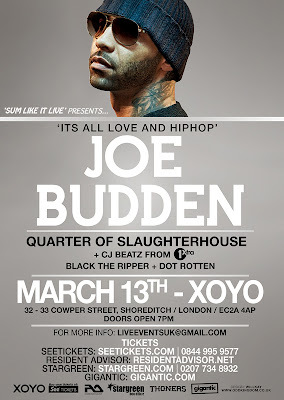 With a new album out 'No Love Lost' which features Tank, Lil Wayne, Kirko Bangz, Fabolous, Royce Da 5'9" and more - Joe Budden will receive support from UK's very own Black The Ripper, Dot Rotten, Tanika, Kwest as well as DJ's - CJ Beatz, DJ Slick and Sneaky. Date: Wednesday, March 13, 2013. Tickets begin from £16.50 (EARLY BIRD) and are on sale NOW as well as meet and greet tickets which are £52.25 (including fees). GET YOUR TICKETS HERE!! !